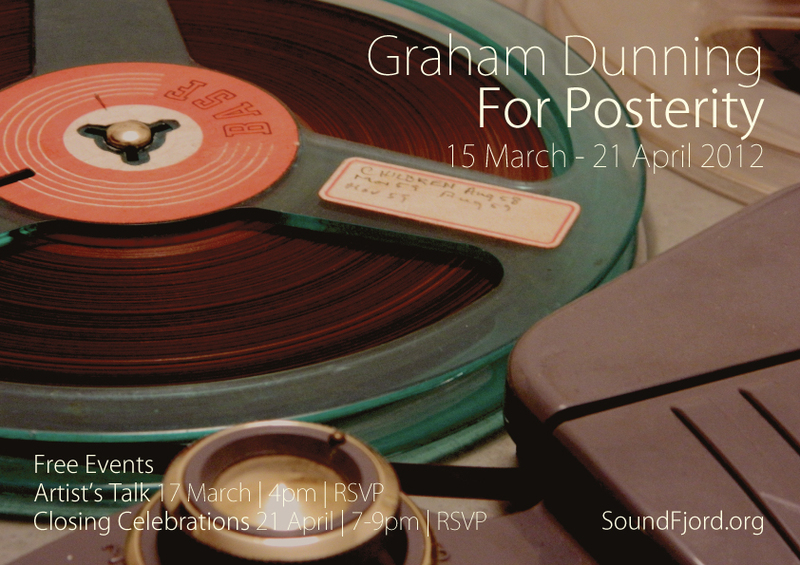 I’m delighted to announce my new solo exhibition, opening on 15th March, at SoundFjord in North London. See the press release for more information. Exhibition: 15 March – 21 April 2012 | noon-6pm | THUR-SAT & by appt. A domestic reel-to-reel tape recorder bought at a car-boot sale, a spool of tape still on the machine. On the tape, a family’s audio diary from 1958 to 1967. In the last entry, the parents explain to their youngest son the reasoning behind the recordings: “It’s for posterity,” the father clarifies. The mother adds, “for your children, and your chi…” She is interrupted, soon the tape ends. This new installation from artist Graham Dunning is an attentive document of his attempt to reunite the tape with its makers. Artefacts and correspondence are shown alongside the machine on which the recordings were made: the uncanny experience of disembodied voices playing through obsolete technology, a ghost in the machine. In an age of digital media where memories – as photographs, videos and audio recordings – exist only as numbers on hard-drives and CDs, or online on a distant server, For Posterity calls into question the apparent advantages of digital over analogue technologies; the role of physical artefacts in preserving our own histories; and the function of archiving per se. Recent debates regarding online privacy focus on the personal traces we leave behind, the “right to be forgotten”, and the implications of policing this with regard to freedom of speech and censorship. These themes are also explored across the installation by way of the considered presentation of both personal and sensitive material.